Israeli soldiers killed, Friday, two Palestinians, and injured at least 123 others, including three who suffered life-threatening wounds, and caused dozens to suffer the effects of teargas inhalation, after the army, stationed across the border fence, resorted to the excessive use of force against Palestinian protesters, in several parts of the Gaza Strip. 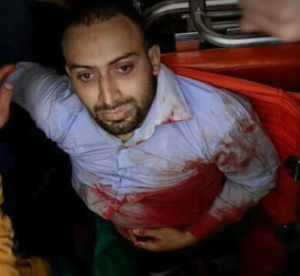 Medical sources in the Shifa Hospital, in Gaza city, said the soldiers killed Mohammad Nabil Moheisin, 29, from Sheja’eyya neighborhood, east of the city, after shooting him with a live round in the chest. The Palestinian was shot by a soldier in a military tower, in Nahal Oz base, across the border fence, east of Gaza city. 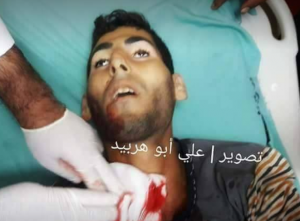 Furthermore, the soldiers killed Zakariya al-Kafarna, 24, from Beit Hanoun, in northern Gaza, after shooting him with a live round in his chest, when the army attacked protesters, east of nearby Jabalia town, and also injured several other Palestinians with live fire. Media sources in Gaza said the soldiers, stationed on military towers, and in tanks across the border fence, east of Jabalia, fired dozens of live rounds at the Palestinians, wounding many, including al-Kafarna, who was shot in the chest. Al-Kafarna was rushed to the Indonesian Hospital, in Beit Lahia, but died from his serious wounds shortly after being moved there. Medics also provided treatment to dozens of Palestinians, who suffered the effects of teargas inhalation. The Palestinian Health Ministry in Gaza has confirmed that 123 Palestinians were shot with live Israeli army fire, and dozens suffered the severe effects of teargas inhalation, in the northern and eastern parts of the besieged coastal region. It added that among the wounded were five medics, and four journalists. In Beit Hanoun, in northern Gaza, the soldiers shot eight young Palestinian men, especially in the area close to Erez Terminal, before they were rushed to the Indonesian Hospital, suffering moderate wounds. Furthermore, the soldiers shot 27 Palestinians in Jabalia, in northern Gaza; one of them suffered a serious injury, while most of the wounded residents suffered moderate wounds. 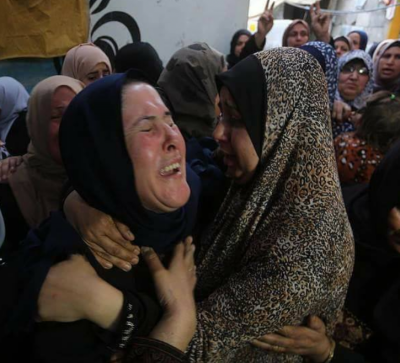 Ten Palestinians were also shot, east of the al-Boreij refugee camp, in Central Gaza; one of them suffered a serious injury, and was rushed to the Al-Aqsa Hospital, in nearby Deir al-Balah city. 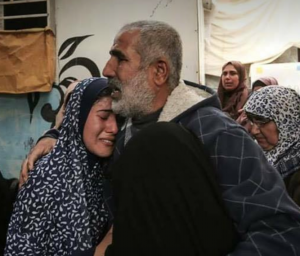 In addition, the soldiers shot 22 Palestinians east of Khan Younis, in the southern part of the Gaza strip, and six others in nearby Rafah, before they were all moved to Nasser Hospital and Abu Yousef an-Najjar Hospital, suffering moderate wounds. The Palestinian Red Crescent in the Gaza Strip has reported that its medics also provided treatment to at least 100 Palestinians, including many women and children, who suffered the effects of teargas inhalation. It is worth mentioning that the soldiers have injured at least 35 Palestinians, including more than five medics, in several parts of the occupied West Bank.